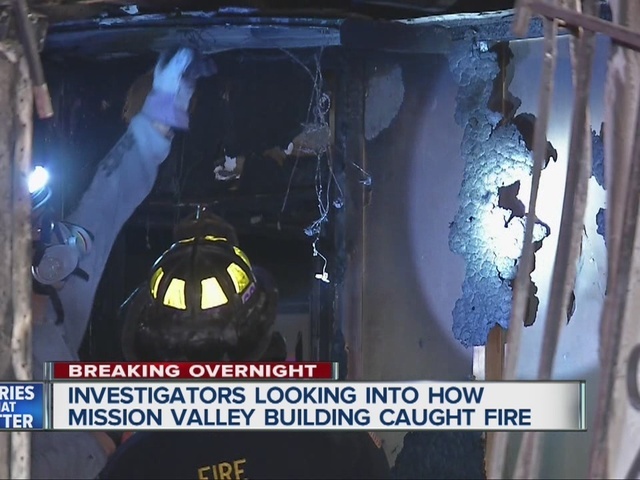 SAN DIEGO -- Investigators are trying to determine what started a fire inside a business complex in Mission Valley Sunday night. The fire broke out at a building in the 2400 block of Camino Del Rio South before 10 p.m.
San Diego Fire-Rescue crews responded and found heavy flames coming from the bottom floor. They extinguished the blaze, but not before it caused serious damage to the building, which houses a few businesses. No one was inside at the time, and there were no reported injuries. SDFR investigators were expected to be on scene Monday to assess the damage and attempt to determine a cause.